General Motors and May Kay, Inc. continue to work together in a relationship that's nearly 40 years old. That's right folks, the pink Cadillacs are still going strong. To date, GM has built approximately 100,000 pink Cadillacs for Mary Kay. An example of the attention GM shows the Mary Kay account is on full display at its factory in Hamtramck, Michigan. 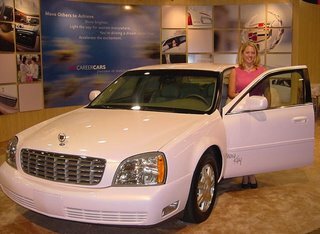 The plant builds about 800 pink Cadillac DTS sedans (the top award for Mary Kay's star sellers) each year.